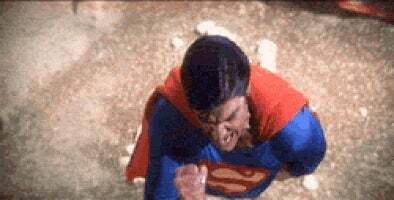 That moment in Superman the Movie that still haunts me to this day. And why I can't watch it as often as I'd like. When I was small, and was seeing the first Superman movie in the theater with my parents, the gigantic earthquake scenes throughout the film’s climax scared the bejabbers out of me. I didn’t do scary or horror movies when I was little. It wasn’t fun for me. But honestly, the moment that stuck with me wasn’t dams bursting, trains nearly derailing, substations exploding. Not even Lois being crushed to death in her own car. Which tapped into a recurring nightmare I’d had since the age of three of being crushed to death. Even then, that’s not the moment that stuck. It was that incoherent moment of rage and loss when Clark’s looking at Lois’ corpse and realizes that the tragedy of losing someone he loved has happened again, and for all his godlike strength and power, there wasn’t a thing he could do about it. Only this wasn’t the loss of his adoptive father. This was the woman he’d let closer to his heart than anyone he’d ever known. Dead as a consequence of someone trying to kill him and all of California. And he’d saved himself. He’d saved everyone else. But not the person most important to him. And the flat negation in his voice. The frustration. The seeming willingness to cast aside every moral lesson he’s ever learned in his life. The moment of giving no fucks as he ROARS in horrific rage. That scream has resounded down my life through every heroic story I’ve read with stakes that huge. The only thing that’s come close is the end of the 10th Doctor’s time as he momentarily takes on the mantle of The Time Lord, Triumphant. I feel that I actively avoided seeing Reeve in other roles because to see him playing a character who was angry or upset, or in the case of Deathtrap by Ira Levin, murderous, it reminded me of that one moment from Superman the Movie. And people call it a goofy thing. Flying around the world.. spinning it backwards. No. Shut up. That’s not what’s actually happening. Even before he reaches orbit, it’s clear he’s having a near psychotic break. He’s hallucinating Jor-El and John Kent as the warring factions of his conscience in the face of his anger. But at this point, he’s well beyond what he should and shouldn’t do. This guy is going to break spacetime and go back to an hour ago and save her. You don’t want to imagine what he COULD’VE done. Had his actions not been motivated by love and a lifetime’s morality saying, “Yeah. This is probably bad, but you’re willing to violate the first law of time and re-write history. You’ll go that far.”? Well, imagine him as angry as he was when he blasted off from the wreck of Lois and her car intent on first murdering Lex Luthor. And anyone who tried to stop him. Imagine him motivated by hate and revenge. You don’t really have to imagine. in 2003, Joe M Straczynski (Babylon 5, Superman) wrote a series for Marvel called Supreme Power, which was kind of a dark take on the Justice League. Hyperion was their Superman analogue, who’d been found by the gov’t, raised in top secret by two specially chosen volunteers in a hyper-patriotic environment. President: How bad is it? Scientist: All right, here it is. We thought we understood the limits of his abilities. We were wrong. He’s been holding back. Satellite reconnaissance during the confrontation tracked his speed as several times what we believes was his maximum. In the past, we’d measured his strength on conventional devices. What we picked up on the monitors can only be charted on the Richter scale. We’re talking here the movement of tectonic plates. Not free-standing weights. President: I’m getting fancy language here, but I’m still not getting specifics. Can you just give me some kind of clear goddamned measurement on how powerful we know he really is, as opposed to how powerful you and the rest of this brain trust THOUGHT he was. Scientist: “The only mathematical expression that works is to calculate his ability in megadeaths. If he were to begin an attack at his peak ability in a randomly selected urban city on the eastern seaboard, he could concievably eliminate a minimum of 2000 people per hour. That figure doubles and triples in densely populated aread where deaths would be magnified by the destruction of infrastructure. The devastation would be beyond imagining. As the destruction continued sweeping across the country, the deaths caused directly by Hyperion would be increased by fire, the loss of dams resulting in floods, starvation by the elimination of roads and food supplies— At an average of 2500 deaths per hour, his potential is a kill-rate of one million deaths every 16.6 days. We’ve seen it other places. Elseworlds comics. Kingdom Come. The Dark Knight Returns. Animated Kal vs. Darkseid. Instances where big blue has lost touch with reality and the gloves have come off. This is the point in any story with Supes in it where stuff just went an order of magnitude off the rails. You see it in the marvel analogues of Supes like Hyperion and The Sentry as well. And you’re glad of the fact that their moral centers are so well entrenched that it never gets into megadeath territory. It still haunts me... that scream out of Christopher Reeve’s Superman. It’s the reason the film isn’t in my top 20. (If we’re being technical, then right now it’s ranked 103 on my Flickchart.) As much as I enjoy it, the moment’s too big, painful and frightening for me. The fanboy in me wants to postulate and analyze. The kid in me wants to go and hide. It’s too much for me, still, I think. I hurt for him too badly. And he still scares me to this day. I&apos;ve finally lost patience with Kazuda Xioto.